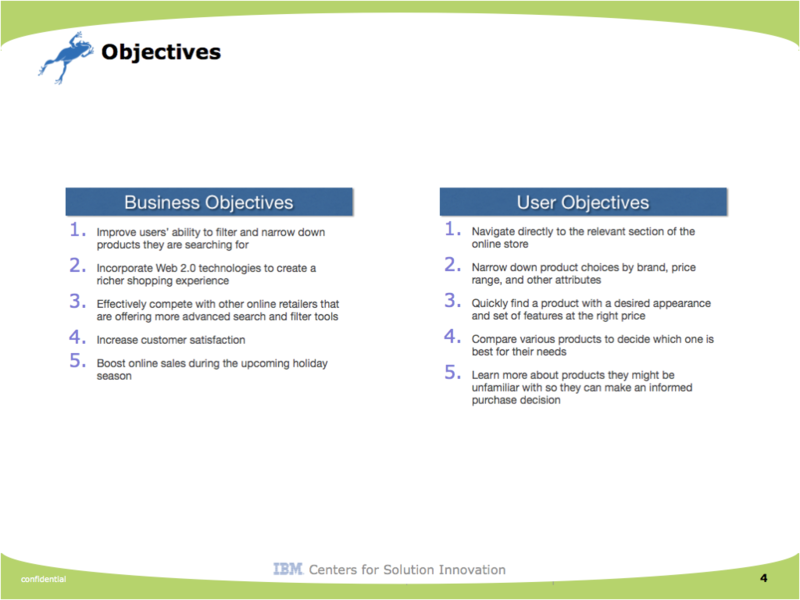 Sears hired our IBM team to redesign and implement a new online shopping experience on their website. Their goal was to modernize the online store and make it more functionally and technologically competitive with other major retail stores’ websites. My role on this project was to usability test prototypes of the new Sears design with actual customers. 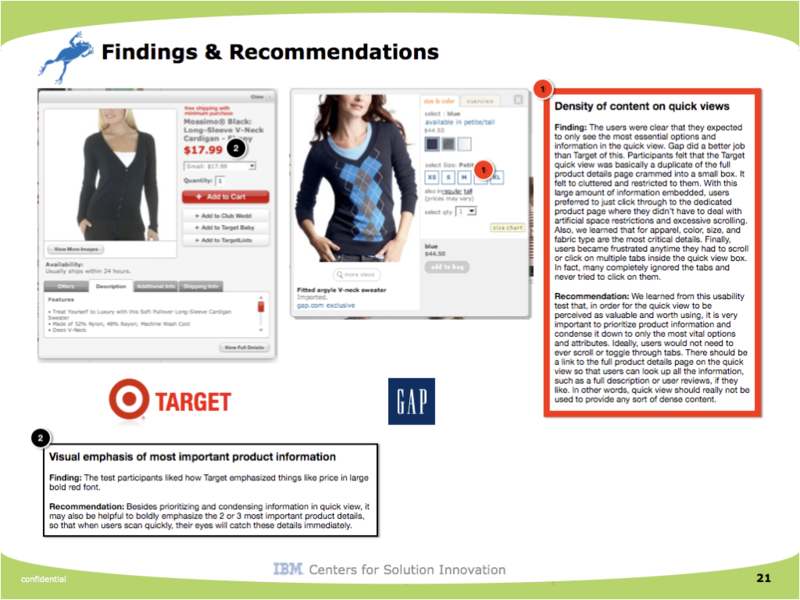 I also had users try to perform the same tasks on several competing websites, including Target, Walmart, and Gap. Sear’s business objectives were to make it easier for users to filter and narrow down products that they are searching for in order to increase customer satisfaction and boost online sales during the holiday season. 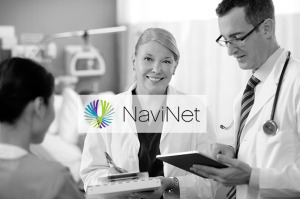 They hoped to make the customer experience richer and more enjoyable by incorporating Web 2.0 technologies and providing more advanced search and filter tools. 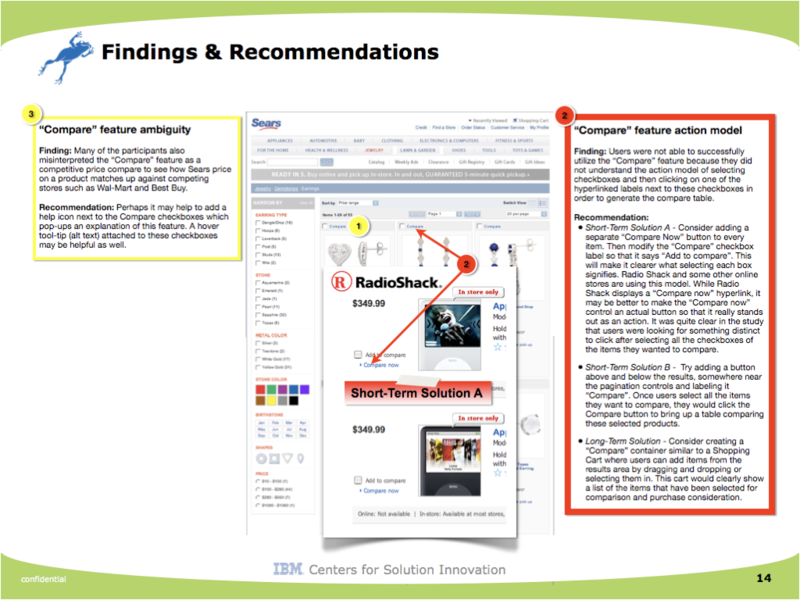 Furthermore, they wanted to make it easier for users to look up critical details about the products and compare them. During the design phase, we conducted multiple, iterative waves of testing, recruiting participants from inside the physical downtown Chicago store and on Craigslist. 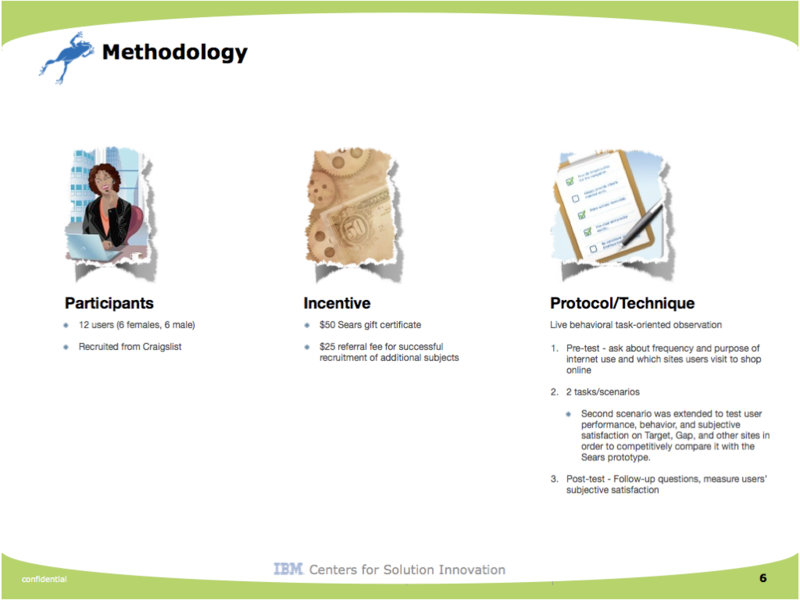 We had each of the users walk through multiple scenarios and then asked them follow-up questions in order to measure their subjective satisfaction. One surprising finding was that users often took a long time to even notice or pay attention to the left-hand facet filters. We determined that part of this was due to a lack of visual design emphasis on the filter side bar, but it was also due to users being overwhelmed by the number of controls presented all at once. We recommended some creative treatments in order to make the side bar stand out more. More importantly though, we suggested initially collapsing the filters in order to make them appear simpler and less cluttered so that the users wouldn’t automatically ignore and gloss over this section of the page. The compare feature was not understood by many test participants. 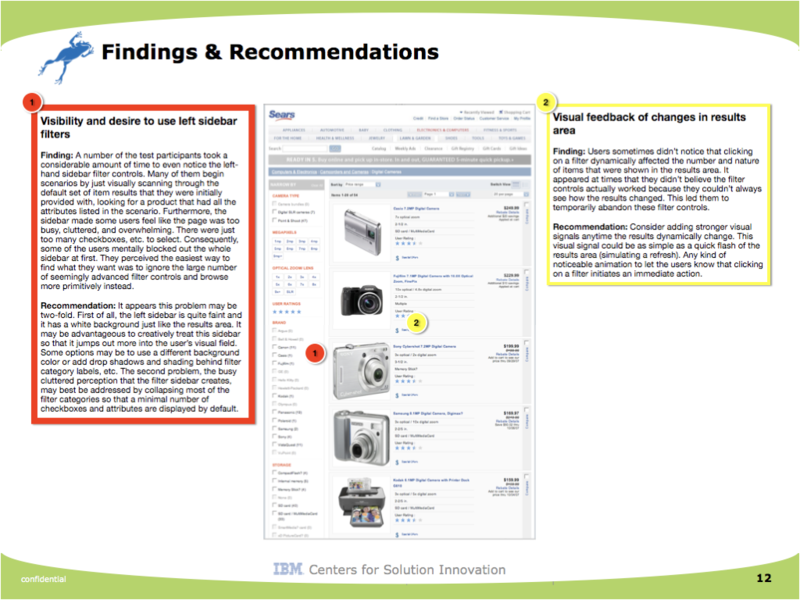 It was often unclear to users how to select items and generate a side-by-side comparison. This was especially an issue when users wanted to compare items that were listed across multiple search result pages. There was no way to easily deselect all items or view which items have been queued for comparison. We recommended the introduction of a container widget at the top of the page where users could view and manage the items that they want to compare. Disable or Hide Zero-Count Facet Attributes? We discovered an interesting design predicament when deciding whether to disable (grey-out) or hide facet attributes when there are no longer items in the results list that contain this attribute (as a consequence of other facet attributes already selected). Users subjectively preferred that such attributes be hidden in order to de-clutter the interface but this created a larger business problem, especially when dealing with brands. 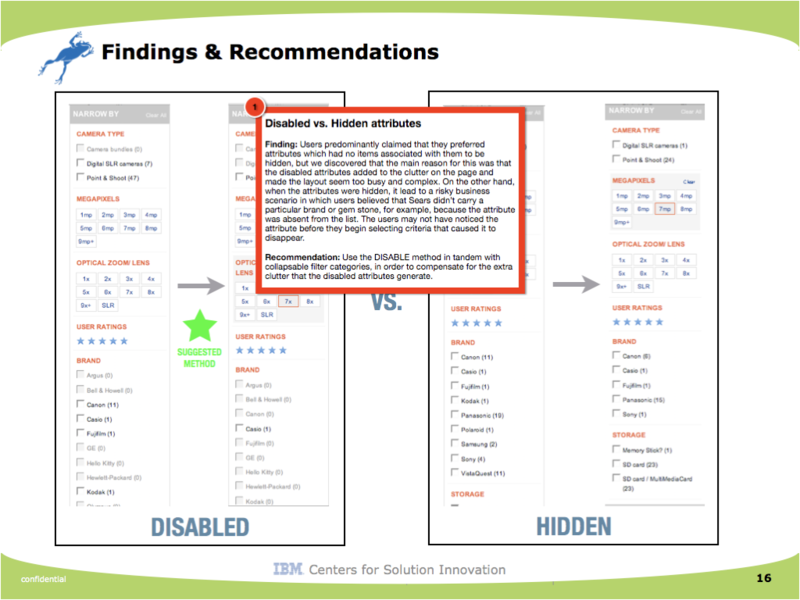 If the attributes are hidden rather than disabled, users may believe that the store doesn’t carry the brand at all and perhaps move onto a different site. We ultimately decided that disabling was the safer choice for the company. Although many users found the slider filters to be intuitive and relatively easy to use, some found these sliders tedious and unsatisfying. Part of the problem is that they required rather precise mouse movements when dragging them and they didn’t provide real-time feedback of the value selected. Furthermore, users often preferred direct selection or clicks as opposed to holding down the mouse button and dragging. We recommended decreasing the sensitivity and granularity of the sliders and incorporating features to more effectively support direct selection. This included increasing the target click area and displaying roll-over values. We found that users did not like a lot of clutter in the pop-up quick views of products. The test participants did not appreciate having to scroll or click on tabs within the quick view. When the quick view contained this much content, they preferred to just go to the full product details page and take advantage of the greater screen real estate. In order for the quick view to be unique and valuable to users, we learned that it is very important to carefully prioritize product information and condense it down to only the most vital options and attributes. Any dense paragraphs of text should be reserved exclusively for the full product details page. One of our most valuable and surprising findings was that users repeatedly tried to use the quick views as a comparison tool. They became discouraged when they couldn’t open multiple quick views at the same time or freely drag them around on the screen. The users strongly desired the flexibility to pop up quick views for several items (i.e. 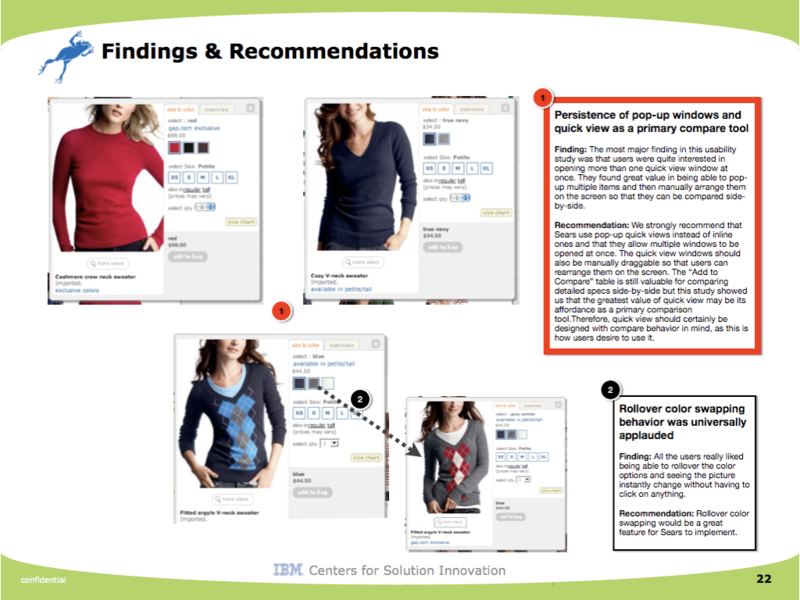 sweaters) at once and manually align them next to each other in order to compare the products visually. 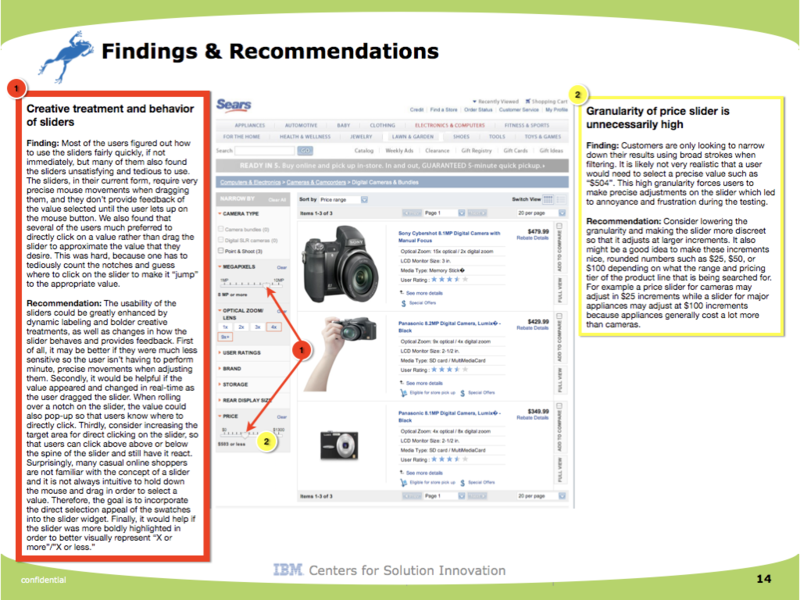 The technical feature compare table is still valuable to customers who are deciding on products such as cameras, but for clothing, users were much more excited about the quick view comparison method.